New european standards have recently become law in the UK. It is now a requirement that new blinds must be 'safe by design' or be supplied with appropriate child safety devices installed. safety devices will also be supplied to secure the cord to a wall. 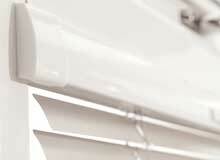 Brite Blinds now install all blinds to comply with the new regulations. A lot of traditional blinds now have to be fitted with a safety device if you require corded or chain operation. 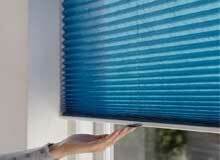 On blinds such as roller blinds you will not really notice a difference. We have been fitting 'easy break' connectors for years. But some blinds such as vertical blinds will now have to have their cords fixed 1.5m above ground level and be retained in a child safety device. Venetian blinds now require easy break devices on the cords but will also have to have cleats fitted for the cords to be wrapped around. The regulations do not cover existing blinds installed before the regulations came into force, however if you have any concerns about your existing blinds we can advice on what measures can be taken to make them safer for use around children. There are many 'Safe by Design' options available for the majority of standard blinds such as wand operation for vertical blinds and spring operation for roller blinds. Aluminium venetian blinds are available with Uniwand and the new Slidewand operation. 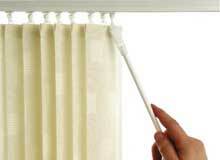 Hand operated INTU and Perfect fit blinds are available for most UPVC windows. See below for the most common 'Safe by Design' options. Don't hang drawstring bags where a small child could get their head through the loop of the drawstring. INTU blinds are designed with safety in mind. No operating cords and they fit most modern UPVC windows. 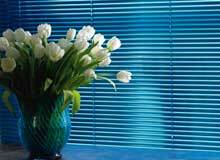 Available as venetian, pleated or roller blind. Perfect fit pleated and roller blinds can be made without cords and fit most modern UPVC windows. 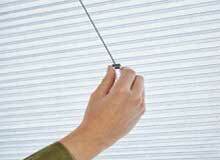 Vertical blinds can be fitted with a mono control system. A single wand replaces the two cords usually used to operate the blind. 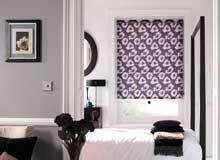 The traditional spring roller blind is coming back into favour due to the reduced risk of strangulation. Our chain controlled roller blinds now come with an easy break chain connector. Aluminium Venetian blinds can be made with the addition of an Ultrawand mechanism combining tilting and raising/lowering into one control. There are many blinds that can be motorised this usually removes any hanging cords or chains from the blind making a safe alternative to traditional operation. SmartCord™ uses a revolutionary and patented cord mechanism to raise and lower the blind. It features a retractable pull cord that maintains a constant cord length. SmartRise is a completely cordless system and ultimate in child safety, this cordless push up, pull down system raises and lowers the product with the touch of a finger. 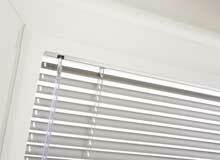 Panel blinds can be wand operated eliminating the need for hanging cords or chains. The blind is simply operated with a wand to slide the panels.